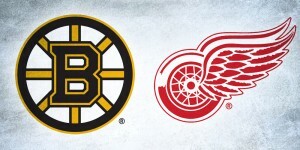 It’s the tenth anniversary of the NHL bringing the game back outdoors, and we’ve sure witnessed a lot of great history since the inaugural Winter Classic in 2008. 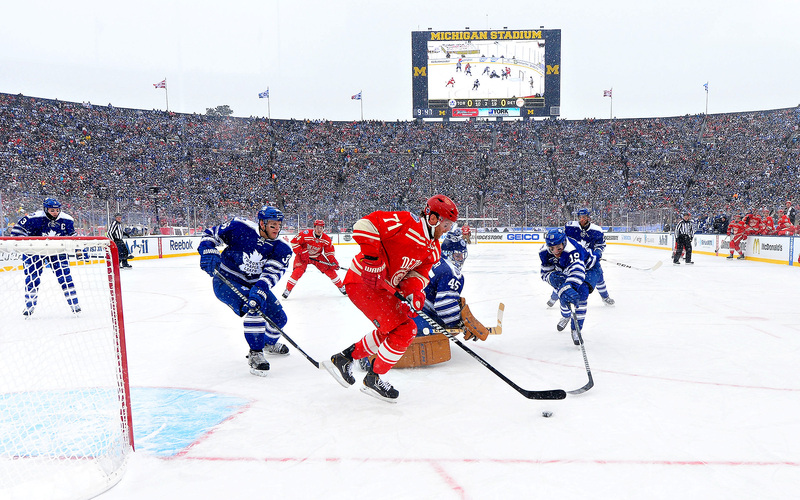 From the stunning sights of the 2014 white out game to Crosby’s shootout winner ten years ago, the Winter Classic has given us an abundance of memories to look back on. Almost as numerous as the highlight reel hockey plays from Winter Classics past are the memorable masks worn in the outdoor games. 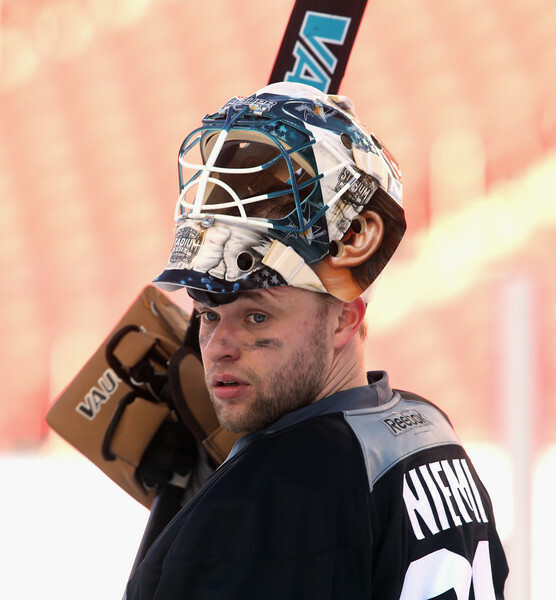 In honor of the tenth anniversary of the event on New Years Day at Citi Field, we decided to rank the top ten masks worn in Winter Classic games from 2008 to 2018. Sliding into the last spot on our list is MAF’s retro 2011 mask that pairs perfectly with one of my personal favorite Winter Classic jerseys. Painted by Stephane Bergeron of Griff Airbrush, this bucket perfectly embodies the “less is more” approach when it comes to mask design. In a time where we see many goaltenders going overboard with excessively complicated mask art, Fleury’s color-blocked bucket reminds us of the beauty that can come from keeping things simple. Paying tribute to and pulling inspiration from Michel Dion, Flower and Bergeron kept things retro and crisp with three solid blocks of color––the Pittsburgh gold on top stands out the most, giving some pop to the triangle in the Penguins logo, and the white lacquer cage blends seamlessly into the white panel in the middle. While this mask may not be the most innovative or unique design, the classic look and crisp execution were enough to earn it a spot on our list. Speaking of crisp paint jobs, none comes to mind more than another Griff creation in Corey Crawford’s 2015 mask. The Blackhawks have played in what seems like dozens of outdoor games by now, presenting a challenge for goaltenders and artists to find ways to keep the special event masks fresh year after year. The simple, sharp lines Bergeron was going for were executed flawlessly, giving us a beautiful finished product that earns the number nine spot on our list. 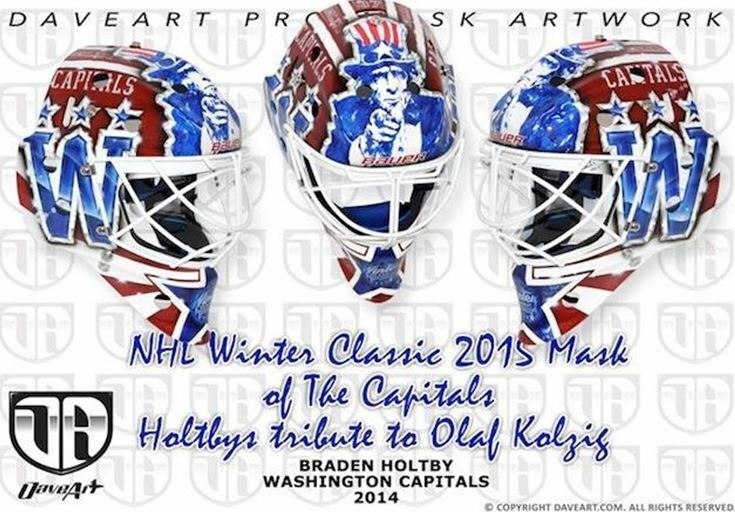 Across the ice from our number nine mask in 2015 was the bucket coming in at number eight, courtesy of Braden Holtby. The Daveart design pays tribute to Olaf Kolzig’s mask (which psst, you can buy in poster form on the Hockey by Design Market), bringing the design into modern day with some signature Dave Gunnarsson effects. “Me and Braden transformed it into a clean cut Winter Classic design,” Gunnarsson shared. 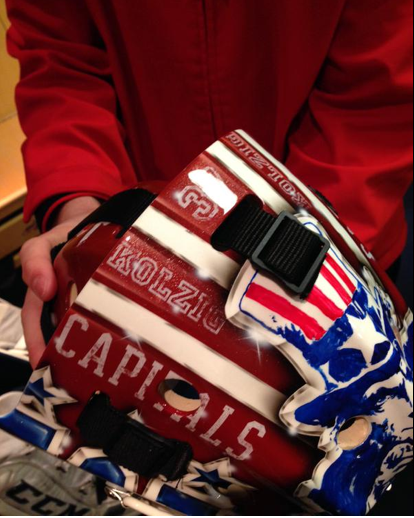 “[From] a distance it is a clean cut design in total harmony with the Winter Classic uniform, and the closer you come, the more details you will discover,” like Kolzig’s name and number stenciled into the stripes on top. Gunnarsson’s execution in balancing his hyper-detailed approach with a bold, retro style here is extremely well done, so a well deserved spot on our list for Gunnarsson and Holts. For the game played at Busch Stadium, the mask features the iconic St. Louis gateway arch with graphic snowflakes and the Blues’ 50th anniversary logo on the chin. 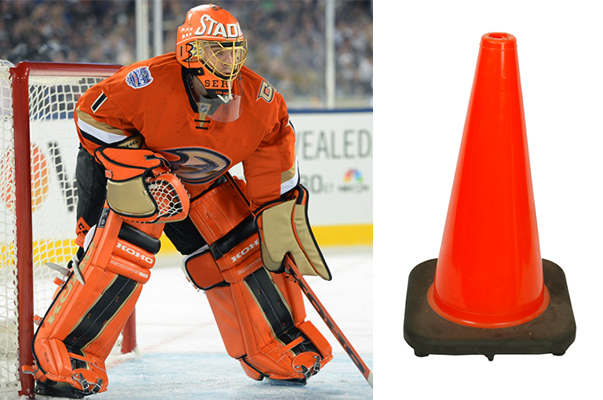 What makes this design so successful is the consideration for not only the event and venue, but the uniform and pads that would go with it (since I think we all want to avoid another Hiller / traffic cone situation). 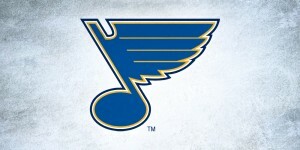 Livery did a great job of executing a clean and well-composed mask that will be remembered by Blues fans for years to come. 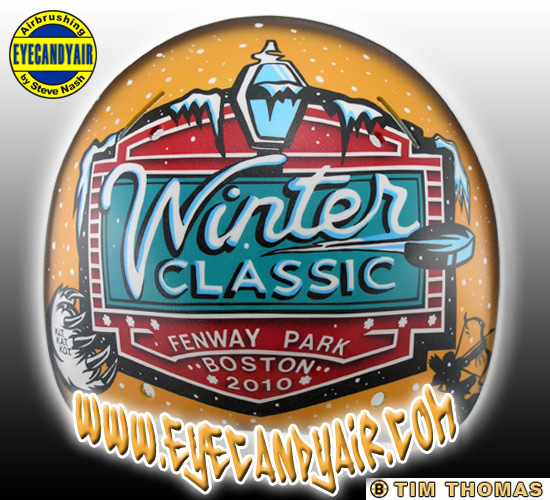 Coming it at number six on our list is Tim Thomas’ 2010 bucket from the Bruins’ first Winter Classic appearance at Fenway Park. 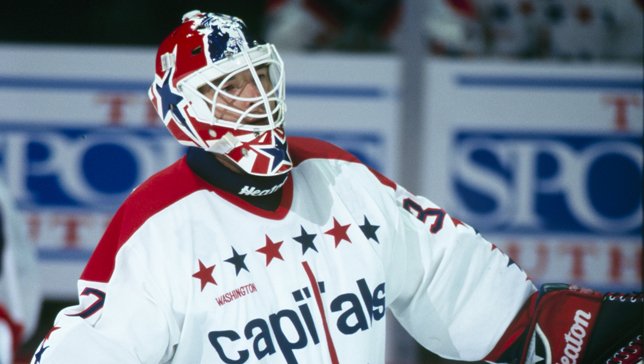 For those of you new(ish) readers, you might be surprised to learn that my first ever HbD mask breakdown was all about Timmy T, so we’re going wayyyyy back in the archives for this one. The vintage Bruins gold and retro portrait of [late legendary broadcaster, Fred] Cusick worked flawlessly with the gold jerseys and the old school vibe of outdoor hockey in America’s oldest ballpark. 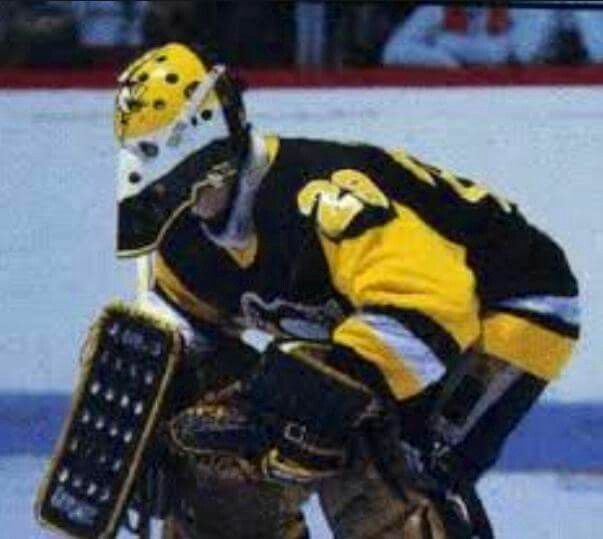 Even the best buckets can be ruined when they don’t work with the rest of the uniform, but the brown and mustard gold played perfectly off the colors and design of the jerseys and pads. The matte paint job and snowy texture were thoughtfully chosen for this special game, and the use of the event logo on the back plate really finishes the mask off perfectly and ties it into the iconic venue. 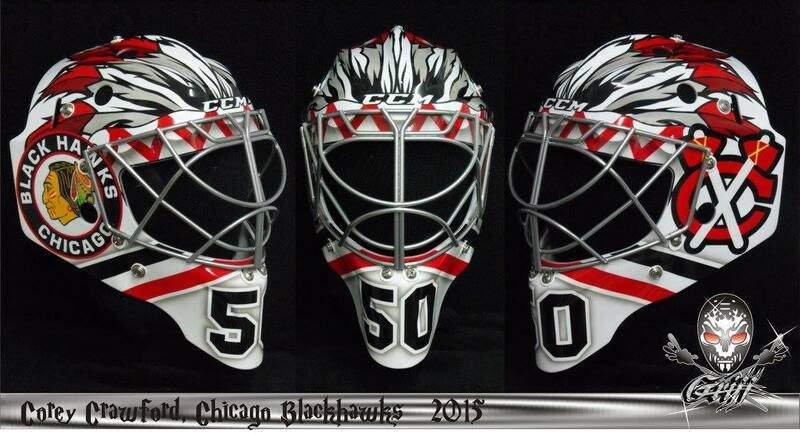 Kicking off the top half of our list is yet another Corey Crawford mask, blending old and new in a unique way that we haven’t seen in many other buckets. 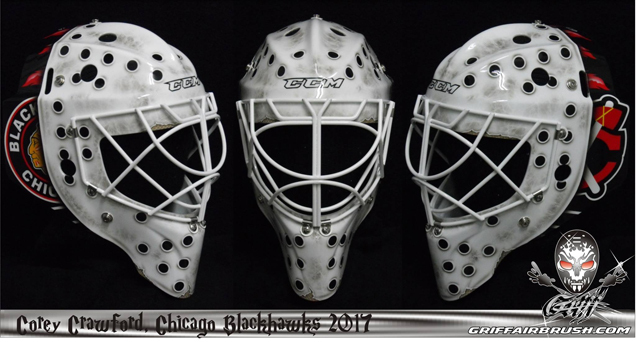 While many goaltenders have gone the illusion route in outdoor games (or what I like to call the creepy “ear mask”), Stephane Bergeron’s approach of using the Blackhawks’ logos behind the illusion face plate is something we hadn’t seen prior to the 2017 Winter Classic. The composition as a whole is very simple, ideal for an outdoor event, but the amount of fine detail worked into this mask is beyond impressive. The weathering around the “holes” in the foreground and tiny tear effects on the edges really make this mask come to life and give it something special and unique. Bergeron’s skillful execution was key in making this a successful end product, and the workmanship and attention to detail here were more than enough to earn the five spot on our list. 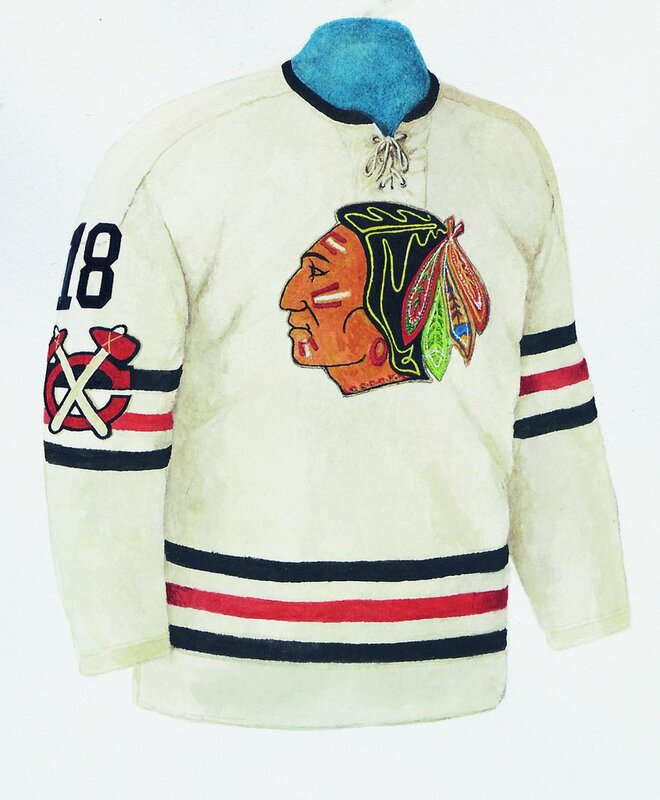 Hopping in our time machine back to the first ever Winter Classic, Ty Conklin and artist Ray Bishop didn’t have much to use for reference when it came to creating a special mask for the inaugural outdoor game. 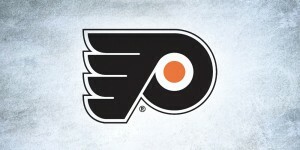 Using the color palette from the Penguins’ baby blue jerseys, Bishop kept things simple and focused on creating a composition using only the team’s logo and scattered snowflakes throughout. 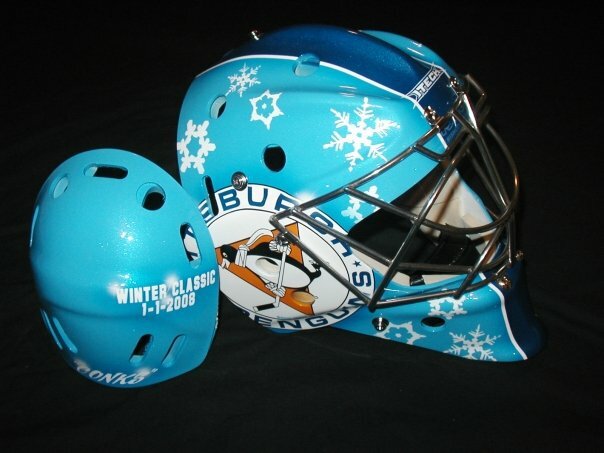 This mask really paved the way for all future Winter Classic buckets and set the stage for the aesthetic that would carry through most Winter Classic masks since. The retro stripe, the simple composition, the crisp paint job and the date on the back––all of these elements made this mask a success back in 2008 and have inspired the most successful Winter Classic masks since, so for that, Conklin and Bishop earn the four spot in our ranking. Ok, so as a New England Patriots fan, I might be a tad biased in ranking Rask’s 2016 bucket so high, but whether you like football, the Pats, or not, I think we can all agree that this mask is pretty stellar. Painted by Sylvie Marsolais, the artist helped Rask pay homage to the kings of Gillette Stadium with beautifully executed portraits of the Patriots themselves. The design was a collaboration between Marsolais and a Bruins trainer, resulting in a crisp, black and white design with layered imagery and the perfect pop of gold. The portraits of Tom Brady, Rob Gronkowski, Julian Edelman and Stephen Gostkowski sit behind a flurry of sticker-like snowflakes and a Pat Patriot character on top in Bruins black and gold. The color palette, composition and artistry in this mask all come together perfectly to make a really excellent end product, and well, anything with Tom Brady on it certainly can’t lose. Painted by Jesse Acciacca, this design fuses the beautiful portraiture of the Cardinals legends and teams’ logos all within designs and textures that turn the entire mask into a baseball. Hutton wasn’t the only goaltender to have a baseball-inspired mask in 2017, with Scott Darling sporting a pair of Cubs-themed buckets for the same game, but the unique approach of transforming the mask into an actual baseball made Hutton’s so memorable. The combination of Acciacca’s creative concept and flawless execution really made this mask a standout and earned it the runner up spot in our definitive ranking. 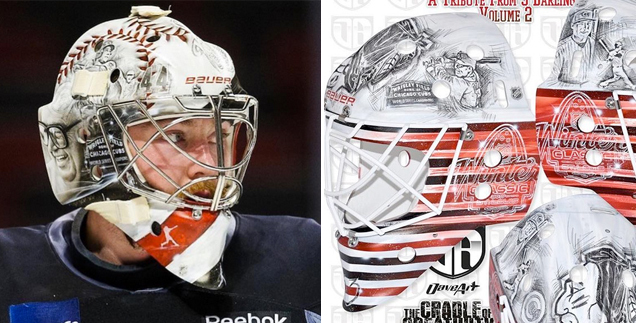 With so many great masks worn over the years in Winter Classic games, it wasn’t easy to pick an end-all winner to claim the top spot on the list, but Jimmy Howard’s 2014 bucket really has it all. 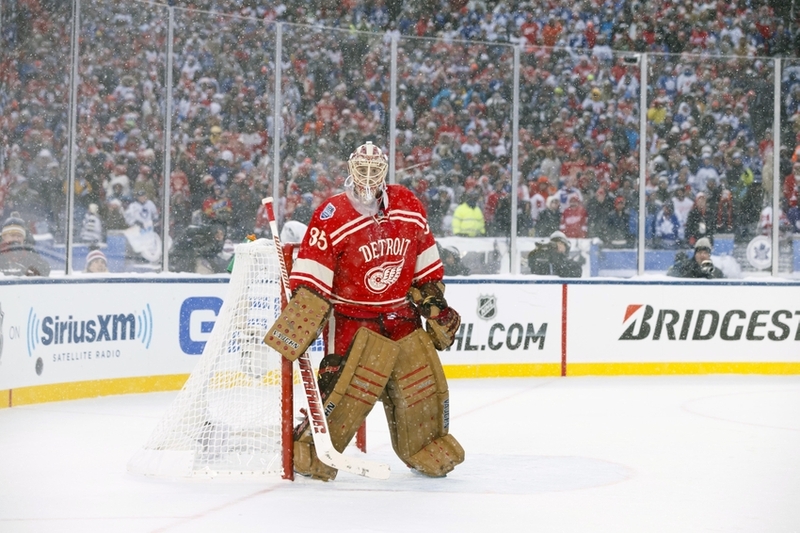 The 2014 Winter Classic at the Big House is perhaps the most picturesque NHL game to ever be played, in part due to the venue and snowstorm, but also because of the stellar uniforms and goalie gear worn for the event. 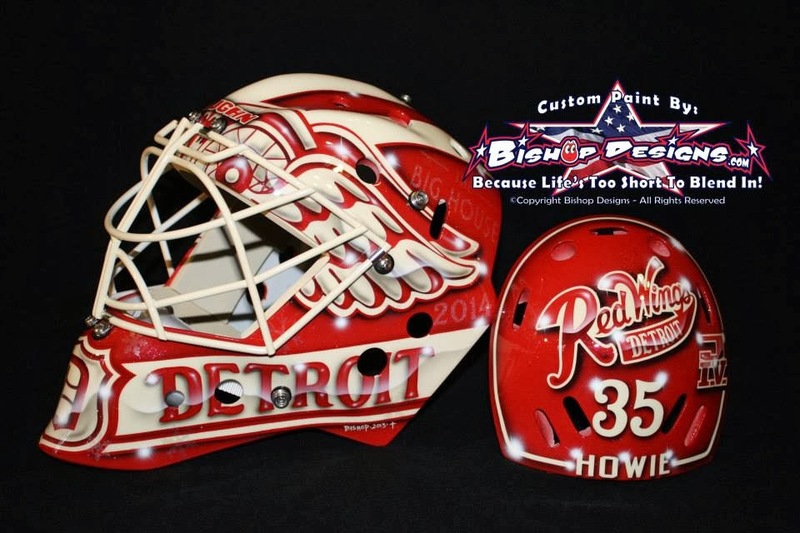 Painted by Ray Bishop, Howie’s mask for the game coordinated flawlessly with the Red Wings’ jerseys and channeled the retro look with a modern flair. Bishop’s use of vintage off-white on the paint job and cage lacquer was a well thought out choice, and the soft shadowing on the lettering and wings gives the design a really nice 60’s-style flair. 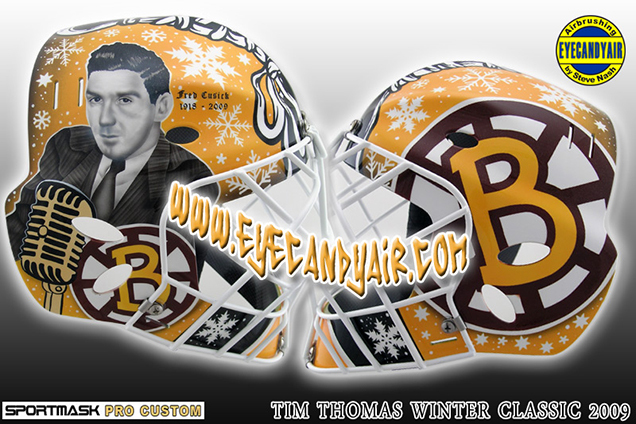 Every mask on this list has some combination of retro styling, flawless execution and wintry elements, making them perfect for outdoor games like these, but Howie’s bucket really excels in the incorporation and combination of all three, earning it the top spot in Winter Classic mask history. Which Winter Classic Mask is your favorite? Let us know in the comments, or on Twitter or Facebook!